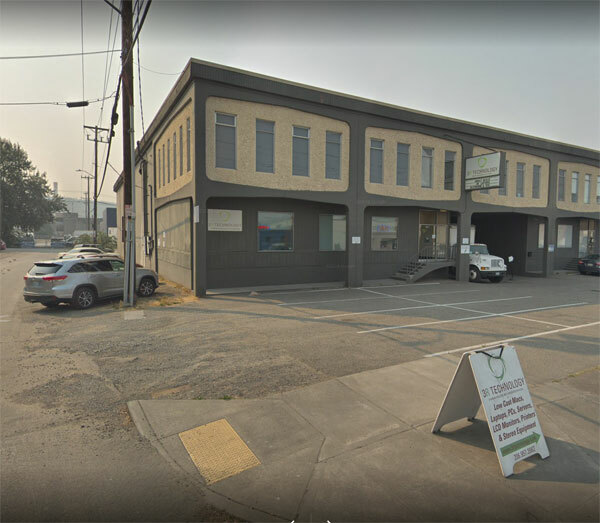 In our Seattle technology outlet stores, you can find everything from refurbished desktops, used laptops, macbooks, iMacs, printers to enterprise network equipment, servers, and power management systems. Peripherals and parts are available in abundance: keyboards, mice, power cable, network cables, sound cards, video cards, power supplies, cases, and more, for the specialist, tinkerer, and fixer. We also have a dedicated audiovisual area with projectors, amplifiers, sound reinforcement, cabling, gaming and more. As a Registered Microsoft Refurbisher, we can provide quality refurbished systems with a fully installed and licensed copy of Microsoft Windows 10. Discounted Citizenship licenses are also available for eligible entities. Become a Facebook fan of our 3R Technology Retail Store! We have special offers, discount prices, and news that we only broadcast to our Facebook fans! Came in on Jan 1, looking for a gaming computer set up. Had great service from a future airline pilot. Not only did we go through a couple boxes. He did some troubleshooting and in all put together a sweet box with an upgraded graphics card. Next day...I brought my buddy Edward H back and he got taken care of with a nice Apple MacBook Pro. Great service, great deals!! Peter was awesome and the deals were awesome. Got a great deal, found what I needed and walked out feeling like my money was well spent!!! Unbelievable customer service. Was helped by Scott and he was an absolute pleasure to do business with. Came to 3R to recycle batteries for my company and was so pleased with the experience that I decided to use my personal Yelp account to review them. Looking forward to working with them in the future! I bought a used monitor and some speakers here for my PS4. The staff were helpful and even checked in the back room for a 4ms connection so my game didn't lag. You should know what you're looking for when you come here and be prepared to sort through older equipment but the prices can't be beat. ~$50 for the 22" monitor and $10 for computer speakers that have pleasantly surprised me. Their return policy is 3 days I think. I work in the networking industry and spend my days designing and building global backbones and large scale datacenters. I'm pretty particular about the gear I deploy for my personal and home networks and generally prefer industrial/commercial/enterprise grade equipment. As you can imagine, that type of gear usually doesn't come cheap. Luckily, tech-refresh cycles can force equipment that once cost tens if not hundreds of thousands of dollars while new back into the market at pennies on the dollar in the form of reuse and recycled resale. The unfortunate part is finding them. 3RTechnology is one of the few places I've found where I can source the quality of gear I'm accustomed to working with for my own personal use. There's plenty of life left in them. They certainly offer more performance than much of the new stuff on the consumer market yet costs less. I've been looking for a official original Apple USB keyboard for a while now, at least a few months, and somehow stumbled on 3R. Wow. They have a little of everything. Hard drives. Memory. Keyboards. USB phone chargers. Wireless routers. You name it. I will absolutely come back here again. Awesome people working here too! Quick, simple, and straight to the point! All you need to do is drive up, get out of your car, walk up to the door, ring the bell and someone comes out. No questions were asked and all that were said was "thank you, and have a good day"
I like everything this company stands for ...........They Reuse, Re market, and Recycle ! thanks to John Hilbert. He could have sold me a real whizz-bang computer .......they have plenty of them. But he stuck to my simple needs and picked out a computer that has me over the moon with joy ! Thanks so much for everything you do ! Found these guys through CL and bought a dell 30" monitor for dirt cheap. Will definitely be back and send people your way! I've used these guys for e-recycling for a couple of years now, but recently I did some shopping at their retail store. I like to find a great bargain, and these guys have the deals, it's worth checking them out. I actually found my deal via Craigslist! Prices are great, found a couple a pieces I had looked for on Ebay, but found a better deal here, and didn't have to wait for shipping. Staff were very helpful and friendly, speedy check out and just enough parking. 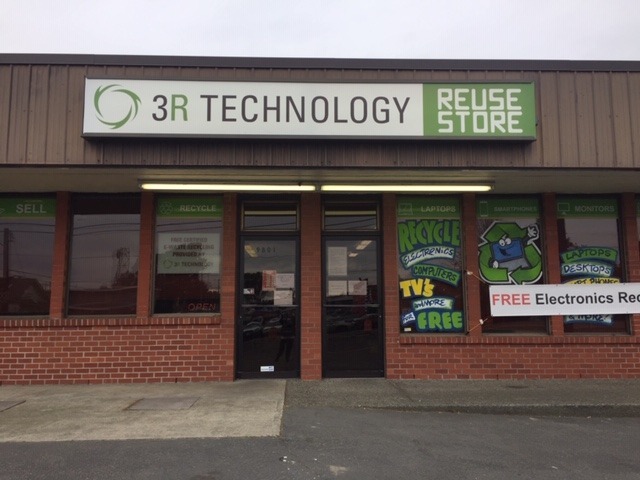 What's not to like about an ethical electronics recycling outift like 3R Technology. I dropped off an old laptop fan there and learned that they take all kinds of old electronics gear as part of the E-cycle Washington program. None of the donated electronics gets shipped off to some other place. All of the materials stay local and recycled the right way. I was greeted by super friendly staff who were just upbeat and happy to answer any questions I had. They have a few aisles of refurbished (they have a repair tech/tester on staff) computer electronics and audio visual electronics for cheap. One of the staff members mentioned that from time to time, they receive some real nuggets of gold as people offload their expensive gaming computer accessories so check back and you might find something cool for a bargain. c) It's a good cause. great!! picked up a huge printer we needed recycled. very professional , followed up to ensure we were happy! I love shopping here - its addicting! I would love to see more products listed online. Amazing service and badass employees - they had everything I needed to get me ready for grad school. Great prices (except for shipping which isn't their fault, ended up being over 75 lbs. haha) and great service. Will be doing business again! Huge selection of items for building desktops (like GPUs), laptops, servers, hard drives, and a lot more. Good prices. Great tech spot. They will recycle old electronics for you, as well. Stumbled on this store during a Seattle visit; LOVED IT!! Decent bunch of guys, very helpful and the type of place you can find useful tecmology. Cisco, F5, pc's and Macs ... Servers, hardware whore heaven. Loved the place. We pride ourselves on our friendly approach and helpful team members. If we don't have what you need, we'll follow-up when we might have it available, or happily refer you to another resource that may have the item in stock. All of our refurbished equipment - laptops, desktops, tablets, displays, printers, servers, network equipment, cables and components come with a 30-day warranty for replacement or refund, no questions asked! The vast amount of our inventory is enterprise-class, chosen by the most cutting-edge high-tech firms in our area. If you're looking for anything Dell, HP, Cisco, Extreme, Silicon Mechanics, or APC, please come see us. We'll let you know about new arrivals, discounts, special events and sales, and more!